In The Eighteenth Brumaire, Karl Marx astutely observes that history repeats itself, the first time as tragedy, the second as farce. He went on to name pairs of influential individuals, throughout European history, whose indelible imprints on the continent basically conform to the tragedy-farce axis. This well-known expression by Marx came immediately to mind as I read, with some fascination, the appointment of Ratu Rakuita Vakalalabure of the Valenisau clan to the titular headship of the vanua o Sovatabua (Natewa) via an elaborate ceremonial process designed specifically to validate the occasion. This episode was covered by The Fiji Times on August 20, 2015. It brings to mind the follies of past choices whose import is still being felt today within indigenous governance settings. I will specifically raise, in this instance, the antecedents that led to Ratu Rakuita's purported elevation in reference to the actions of his father, Ratu Tevita, before him. This account has wider ramifications for traditional leadership roles and challenges in Fiji today. Let me preface what I have said above by highlighting my interest in all this. I am a member of the Valelevu clan in the village of Natewa. In 2014, we installed Ratu Ifereimi Buaserau as the Vunivalu of Sovatabua (Natewa). 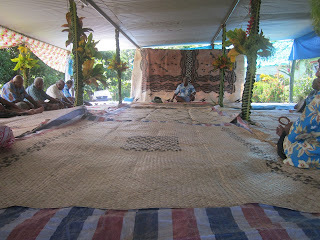 This was done with the expressed agreement of all the masi ni vanua (heads of clans in the vanua of Sovatabua). 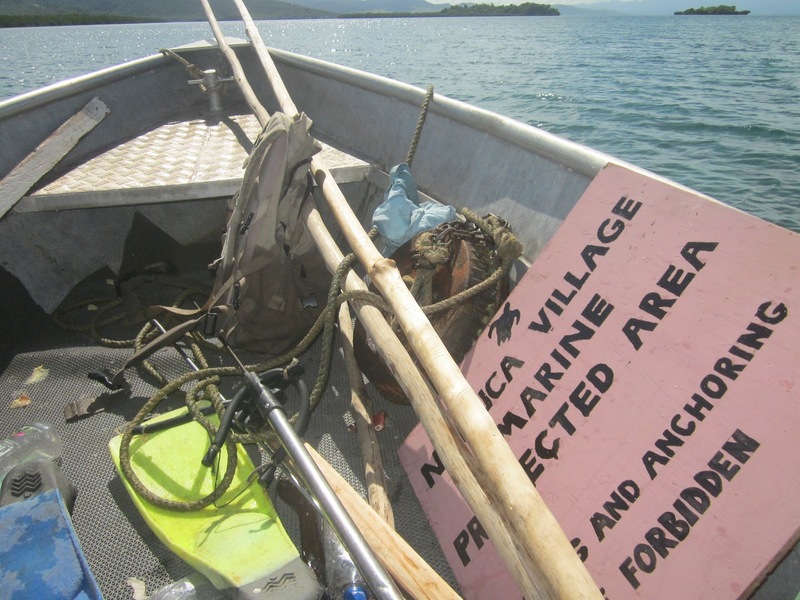 That installation was, later on, endorsed by the iTaukei Land and Fisheries Commission (TLC), the statutory authority on chiefly titles, and their legitimate holders, in Fiji. All this, however, did not deter Ratu Rakuita and his group from staging a ceremony in a flagrant disregard to accepted Natewan etiquette. I am convinced the root of this brazen act is connected to the actions of his late father. The dispute surrounding the vunivalu title today, in my view, stems from the botched attempt by Ratu Tevita Vakalalabure in 1972 to install himself as the vunivalu. He used his own mataqali of Valenisau and a motley crew of supporters to carry out the deed. In so doing he undermined the protocols governing the installation of a Vunivalu in Natewa and invented a template that was adopted by his son, Ratu Rakuita Vakalalabure, more than 40 years later — a sinister ruse calculated to override the consensus of the vanua whenever the need arises. In light of this blatant disregard for custom, the Valelevu clan brought proceedings against them to the TLC and subsequently installed Ratu Lotaropate Rakuita Saurara as the vunivalu. The closing rites, or vuluvulu, to this ceremony was covered by the Volagauna, the Fijian vernacular newspaper, in 1974. Undeterred, Ratu Tevita and his followers kept on the pretense in the face of overwhelming consensus against them in the vanua. However the bulk of this charade was carried out in Suva using media outlets as a way to impress the gullible. This period, thus, was marked by the emergence of factional power players in search for their own fortunes within the Natewan communities, throughout Fiji, via the use of manipulative strategies designed to curry favour with one side of the divide or the other. When Ratu Lotaropate died in 1985, Ratu Tevita immediately renewed his claims in the vanua based on that botched initial process that, in my view, was nullified by the elevation of Ratu Lotaropate to the title. What was different this time around was that Ratu Tevita was well ensconced within the ruling urban and political elite based in Suva. As such he was ideally placed to manipulate the linkages, first observed by Max Weber, that exist between money (wealth), status and political power to his advantage. The vanua did not, nor did he let it, go through the required process to validate his claim. Tragically, for reasons best known to ourselves, we accorded him a burial ceremony befitting a bona fide vunivalu when he passed away in 2005. On August 21, 2015, Ratu Rakuita, who incidentally carries a name from my mataqali, took the path blazed by his father nearly a half-century ago in an attempt to make himself the vunivalu. This trail, admittedly, was only followed after getting strong resistance from the different clans in the vanua in relation to his aspirations. Again using his mataqali as a base, he created a farcical ceremonial spectacle designed to cover up the conspicuous absence of traditional stakeholders without whom the installation becomes null and void. For instance, in Natewan tradition, the turaga na mai dreketi is the one who symbolically gives the ceremonial bowl to the vunivalu-designate. Failing to get the current mai dreketi's co-operation they went ahead inventing a new tradition that would hopefully, in their eyes, cloak the naked power-grab in more suitable attire. In light of Rt Tevita and Rt Rakuita's political past and buttressed by similar incidences around the country, I would venture the premise that the hijacking of vanua chiefly positions by aspirants using political connections that were forged during their time in national politics or public life is well and rife in Fijian indigenous society. Ratu Rakuita, who seemingly believes in a process that, in practice, excludes the participation of the masi or different chieftains in the vanua (a fact noted by reporter Serafina Silaitoga) was quoted by The Fiji Times (20/8, p. 3) as saying, "that only death could part him from the title that he was bestowed". As far as we in Valelevu are concerned, he is welcome to take with him to his deathbed whatever title that was bestowed on him in that ceremony. Given the event was in direct opposition to accepted Natewan conventions and the fact the iTaukei Lands and Fisheries Commission has already endorsed Ratu Ifereimi Buaserau, following the traditional confirmations by Natewan chieftains, as the Vunivalu of Natewa, it is hard to imagine the significance of the debacle that is cloaking itself in traditional garb as reported by the various centres of infotainment. Be that as it may, the consequences of this usurpation will, however, be telling on the ordinary people of Natewa as they grapple with the vagaries of modern life. Already the tale of the current dispute in Sovatabua reads like the internal machinations of the Roman triumvirate to outdo each other while the barbarians lurk outside their borders ready to deal a fatal blow to the realm. Indeed we take up so much time trying to sort ourselves out in relation to chiefly leadership in Natewa, and within Natewan communities in urban settings, that the plight of the ordinary man, woman and child from Sovatabua has taken a back seat. The story of my vanua is an extremely important one for traditional systems of governance in Fiji today as it closely resonates with the narratives emerging throughout the different regions of the country. As the media outlets, including social media, abound with stories and photographs of the latest installation in Natewa, its second in two years as it is glibly put, it is perhaps worth our while to point out some issues that need to be taken to heart by each and every iTaukei if we are to protect our personal dignities as well as the integrity of the vanua from which we hail from. At the hub of these issues is the observation that much of what is happening in Natewa today is similar to the experiences of other vanua as social differentiation gives rise to competing value spheres in contemporary Fiji. Perhaps the time has come for the TLC to take some pre-emptive steps and conduct a thorough investigation using new and accepted methods of social research to ascertain the validity of truth-claims in relation to sworn accounts contained in the Tukutuku Raraba. It has to be done for the whole of Fiji. This strategic move takes on additional importance when it becomes clear that our understanding of our respective Tukutuku Raraba is at odds with one another. As for Natewa, I will end by recounting the story of Martin Frobisher, an Englishman who excavated on the scoured Canadian foothills in the 16th century and unearthed a mineral, iron pyrite, which he, inadvertently, managed to pass off as gold in England. The glitter remained as long as the rest of the English population was convinced that it was the genuine article. It, subsequently, lost its value when the truth about its constituent elements finally emerged out of research laboratories. I would imagine that, ultimately, the tale of the father and his son, and their ways in Natewa, will go down this well-trodden path. * Dr Tui Rakuita is a lecturer in sociology at the University of the South Pacific. The views expressed are his and not of this newspaper. 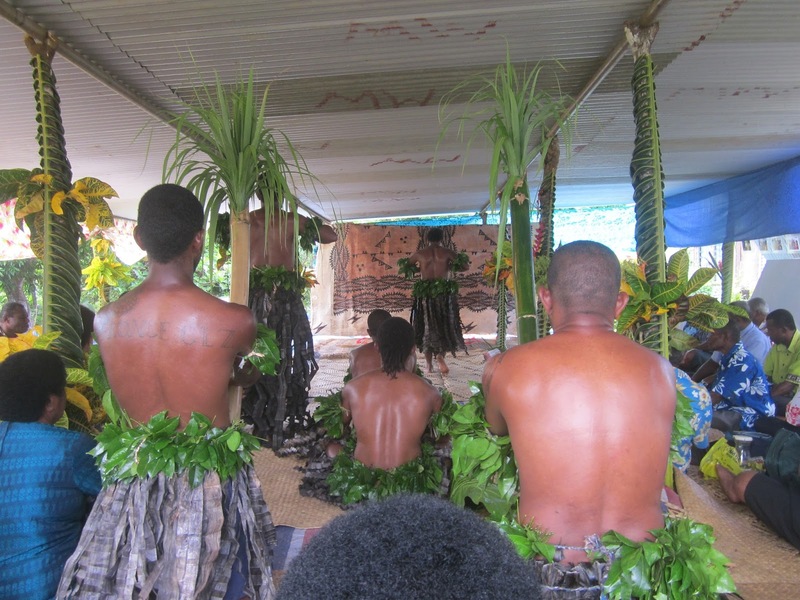 A new chief has been installed for Namotomoto village in Nadi following a traditional ceremony this morning. Viliame Vikoso has been appointed as the new Taukei Tukani a chiefly title passed on to him after his elder brother’s death earlier this year. Village spokesman Iliesa Samusamuvodre says it’s a special day for the village completing their traditional structure and a process their ancestors have followed for many generations. The 52 year old was next in line and will now take on the role as their new chief. Samusamuvodre says as landowners they need a strong leader with the number of developments taking shape in Nadi. Click Links to Find Out! 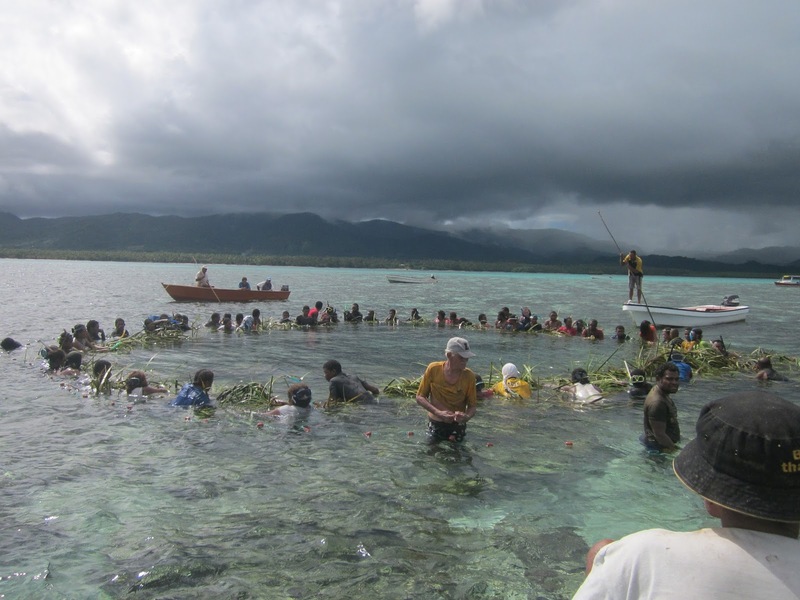 Around March, my village was slated to play host to one of those big all important fishing grounds meetings like the one we went to to request permission to set up our tabu area from the high chief of chiefs Tui Cakau. 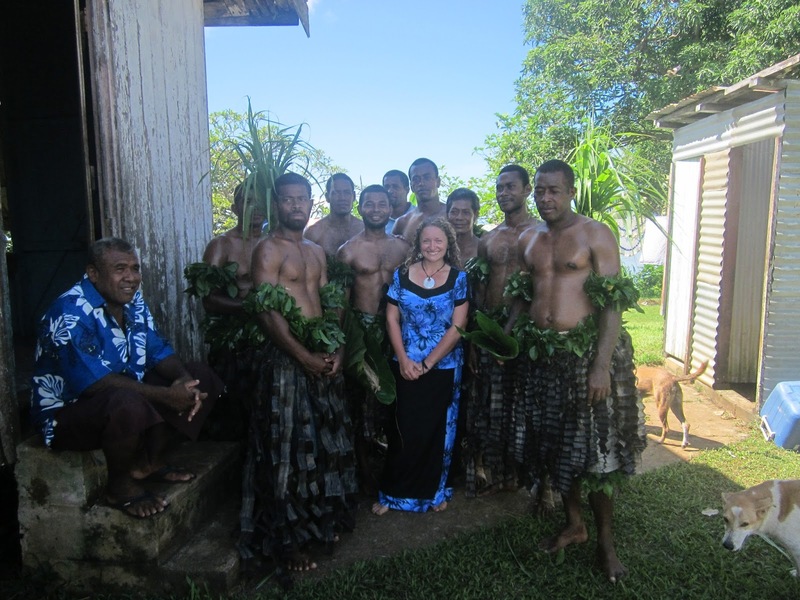 That meant that Tui Cakau would be coming to our village for the first time in about fifty years. We were just all of a dither. Part of preparing for Tui Cakau's arrival was the giant fish harvest. This would be a traditional gift to Tui Cakau and his people, it would also feed the participants of the meeting, and the remainder would go to our community for their sale or consumption. I was very torn over this whole situation. I had a sincere desire to be a part of my community in all aspects, to see and experience new things within this different culture and to respect the rules and traditions therein; it was also important to me to continue to maintain a good connection with Tui Cakau and the other leaders of our province so that when I put forth suggestions, ideas, or project proposals they won't fall on deaf ears. 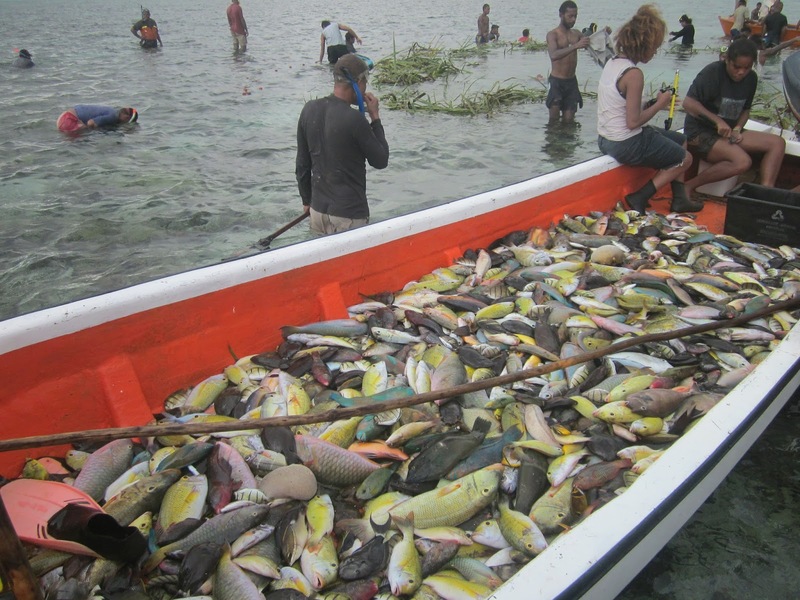 However, the very basis of this giant fish harvest was essentially going against every conservationist message I had been trying to spread. Now, we agreed in the bylaws of the temporary marine protected area that it was temporary in the fact that it would be opened once a year around Christmas time for people to have some extra freedom in preparing for the feasts of the holidays. After opening it for a week or two, it would be closed again. This, of course, is only in reference to our smaller tabu area and is completely separate from the larger permanently closed area. In honor of this important meeting, the villagers chose not to open the tabu at Christmas time and postponed it until March. I did not have a problem with this nor did I have a problem with temporarily opening the tabu for fishing. My concerns stemmed from how this fishing was to be carried out. We did something called a Qoli Wawa. It is a rather rare event and hadn't been done in our community in over three decades, possibly because it requires close to a hundred people to help. For the week or two leading up to the event, the community was busy preparing the hand made rope that was to be used. It was close to a half a mile long and consisted of beaten vines woven together with split coconut fronds braided around it. 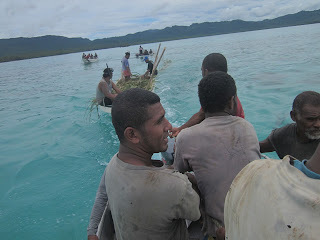 On the day of the event, all those involved boarded one of the half dozen or so fiberglass boats we could scrounge up for the day and sped out into the middle of the tabu area (approx. 1 km from shore and 1 km from the reef break). Once the entire armada had arrived, the elders with experience took charge directing which boat should go where and in what order. Some of the boats grouping in the middle of the tabu before getting started. Essentially, the lead boat was the boat with the giant vine rope in it. The plan was for these guys to drive in a huge circle within the tabu area whilst letting the vine drop out little by little from the back. The remaining boats would follow and people would dive off these moving vessels navy seal style at periodic intervals along the rope until eventually the entire rope had been released forming a completed circle with divers spaced regularly along it. For the next 3-4 hours, the divers worked together (with direction from the elders still leading from the boats) to bring the rope ends passed each other and to little by little coil the monstrosity up - thus making the circle smaller over a long period of time and forcing the fish inside to get trapped in the center. My first problem with this, and I can attest first hand from the scars still remaining on my legs, is that all of the divers in the water were just trampling corals left and right in their effort to maintain control of the unwieldy vine in the current and waves. 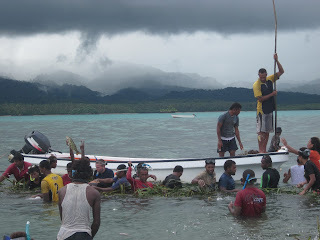 While the tide was going out and the water level dropped to waist height, the people in the water were still trying to work the vine into a smaller and smaller circle and effectively destroying all of corals within that original circle's area in the process. After close to four hours in the water we finally managed to close the vine into a nearly solid barrier. At this point the circle's diameter was only about 30' across. My second serious issue arrived when it was time to catch the fish that we had trapped. While I do not want to besmirch the reputation of anyone from my community, I cannot tell you how upset and shocked I was by what transpired. For months now, I had been working with my community to understand this upcoming event and to help prepare for it. My chief wanted to perform the event the way it had been traditionally done - using a poison derived from the root of a local plant called Duva. Basically, once all the fish are trapped in the circle a few people jump in the middle with this root, put it in the water and grind it up in their hands until its juices start to mix in. Once the fish are poisoned they start to act erratically and attempt escape at which point the barricade is able to stop and catch them. This doesn't just kill the fish in the immediate area but the corals and every little living thing within a 2 mile radius (as the poison is carried by the current and waves and apparently even a small dose is enough to cause harm). It is also illegal. Upon discovering this I did all I could to discourage this method and as an alternative, I coordinated with the ministry of fisheries to borrow their giant nets for the day, which are several hundred meters long. The nets were dropped off the night before and I was immensely relieved knowing that we would at least be doing as minimal damage as possible in that regard. The nets were taken out in a few of the boats that day and once the circle had been constricted to its final point, the nets were laid out in concentric rings around the group with the vine. Then someone on my boat (I was out of the water at this point to take pictures) withdrew a large flour sack from under one seat, opened it up and withdrew giant fistfuls of duva. I was taking a video at the time and you can audibly hear my shocked voice ask dumbly what that was and another girl in the boat joke to me about pounding it up and drinking it like you do with grog (which comes from a root as well). And then it dawned on me that after months of discussions and encouragement about not using the poison and after working hard to acquire the nets to use instead, the community all just nodded and agreed and then went and planned on using duva anyway and just didn't tell me. How did I feel? Well, try to decide how you would feel after almost two years of working with this community on sustainable fishing and believing that you had garnered trust and understanding. Things like this are par for the course while doing development work with a very different culture and I knew that but it didn't make me feel any better. After all the fish had been collected, the vine was tossed in a boat and we all returned to shore. 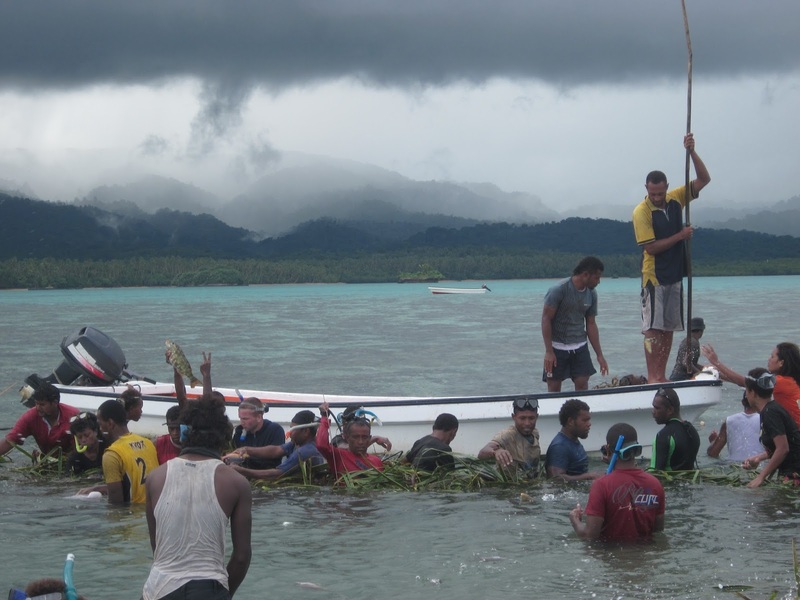 The fish was then brought up to the village center - the bulk of the catch was to be brought across to Taveuni for Tui Cakau and his community as a gift while the rest was divvied up into equal piles for the families of the community and for the meeting. The village was proud of their gift to the high chief as they were able to send several thousand fish and many of them were large in size. Later, Tui Cakau shared to me in private that he was impressed with the gift and was convinced of the effectiveness of creating tabu areas on recovering fish populations and size. While I still do not agree with the way things unfolded during our qoli wawa and still can't help but feel a little betrayed I am actually appreciative of many things. That I was able to see and experience this centuries old and rather rare method of group fishing in a subsistence community. I imagine that centuries ago when they were first discovering the powers of the duva root and how useful a tool it could be in catching fish, the reefs were healthy and bountiful and could handle the very occasional mass fishing event. I have respect for the skill they have honed in preparing for and conducting the event with the efficiency of the military and I was glad to have learned the process, which not only helps me understand their culture, history, and traditions better but also gives me a better perspective of their 'side of things' when it comes to me giving them workshops on the reef ecosystem and sustainable fishing. In the end, a silver lining shone through when the results of the event reaffirmed Tui Cakau's support and belief in the effectiveness of protected areas on recovering the reef ecosystem. So, does this mean that I believe the ends justified the means? Well, no, definitely not - I'm still an environmental conservationist! - but I will be grateful when something positive can result from something so negative. The meeting went off without a hitch the following day. Each village has their own special relationship with the high chief and as such performs their own unique ceremony upon his arrival. In general, however, this involves the presentation of grog by the men, mats by the women, and some kind of food from everyone. 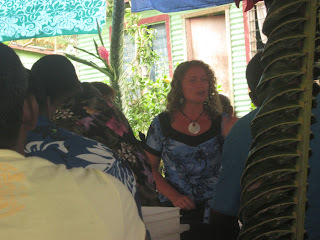 Tui Cakau - I took this picture whilst presenting mats with the women. Once the beginning ceremonies are completed, which can sometimes take up to two hours (I think ours was only about an hour or so), the meeting begins. These are known to last for 3-4 hours as there are all sorts of topics being discussed including last meetings minutes, new projects, the scholarship fund, general issues, and sometimes me. I'm usually the last person on the docket to be given time to speak. This can be particularly frustrating if you are personally asked to prepare a specific presentation for a meeting and then during the meeting be asked by said requester if you still have something you want to say because otherwise we can adjourn and everyone can go enjoy lunch, which is always met by a lot of nods from hungry member participants, and when you say yes you'd like to speak be informed that you are being allotted 1/10th the amount of time expected and have already lost much attention from those just wishing to fill their stomachs. I believe I more or less shouted my presentation at the increasingly restless attendees as fast as I possibly could to fit my time slot. But, I know at the very least I had a handful of people nearest to me listening intently and managed to have some nice in depth conversations with some after the meeting finished. Sometimes I think I'm more productive when I'm just sitting and chatting informally. In the end, we had several people come up to us (my counterpart and I) telling us they couldn't believe how big the fish were that we were serving for lunch and that they wanted us to come and give presentations directly in their village on creating and managing their own tabu areas (since they couldn't fully get the gist of my presentation that day). It was heartening to hear that people were beginning to see the changes in the reef and the importance of protecting some of their own environment. The rest of the evening was spent drinking grog and celebrating the successful completion of the event. So then what was the point of this whole tale into the trials and tribulations of preparing for and carrying out this meeting? To divulge just how challenging, frustrating, and time consuming such projects can be but also to emphasize the fact that though such struggles are to be expected when in the early stages of developing new topics/ideas like environmental conservation and sustainable fishing, small successes and steps forward can be possible even if they come in unexpected forms. I've decided, therefore, to not be discouraged into uselessness by my failure to convince my community to not use poison while fishing but rather to strive on and try a different path. I'm looking forward to testing out my new position as a provincial environmental resource management volunteer in town and to see what new ways I can reach out to my community because those small successes are worth it. Who is Bainimarama and Khaiyum Fooling with their Secretly Developed Constitution? Having to end today with the news of the Fiji military regime finally unveiling its final version of its Constitution for Fiji can only be described as a real painful experience, yet totally unexpected. The grin of a corrupt legal wizard thinking he has all escape routes plugged! Painful when the occasion is being overseen by Khaiyum who, like a half castrated tom cat, put on his cheeky grin while holding on to his copy of the document, reflecting his satisfaction in thinking, he has yet again tricked the people of Fiji with his amateurish legal wizardry. Unexpected though, in that we all know the real motives behind the design and content of the document. Such a key document, when treated and developed in such cavalier and amateurish manner by its sponsors, deserve only to be rejected outright and thrown into a waist bin as fuel to fire nationwide derision, ridicule and contempt. It is no wonder, political parties and organisations with much more brains and experience of constitution-making boycotted the unveiling for good reasons. 1. protect the regime and its members from facing trial for their treasonous crime. 2. prolong the rule of the current illegal regime. 3. elevate and empower the military with ongoing power to interfere in politics. 4. entrench the immunity provision on the regime and its members. 5. consolidate real power in a few key positions controlled by the PM and AG - we know who are the people earmarking themselves for these! 1. threw out the Ghai draft since it was a widely consulted-on document. 2. need the military on their side to ensure their hold on power. 3. have most to lose if the Ghai version is adopted and not the version unveiled today. 4. stand to gain from an open ended immunity coverage, even those illegal acts yet to be committed. Any assessment along the above line will reveal that the current document is no more than a ticket for the current regime to rule in perpetuity and without any check against their policies and programmes. It is precisely for those reasons that it must be rejected outright by the people of Fiji. The people and nation of Fiji deserve better than the feeble and treasonous attempt by an illegal regime to profit from their takeover of a democratically elected government that had the mandate of the people of Fiji. To now attempt to entrench their rule by a document that has no mandate from the people, concentrates power in the hands of a few, authorises future coups via a pliant military, is treating the people as dumb with no legal authority or moral soul. 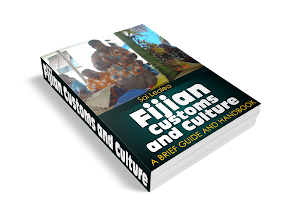 All the people of Fiji and those who love Fiji should do the right thing and throw the unveiled constitution of the current illegal regime into the bin and light it in a bonfire to truly reflect what we all think of it. "Expressions of hope for future worth celebrating." The whole country ought to be celebrating the historic settlement with Tuhoe signed at Parliament last week. Tuhoe marked the occasion by turning up in large numbers, filling Parliament's Banquet Hall, Grand Hall, Legislative Chamber and lobbies as well as the Pipitea Marae nearby. It puts to rest grievances that have festered for up to 160 years in the Ureweras where Tuhoe resisted the Treaty of Waitangi and asserted their independence. Not all grievances have been resolved; the police counter-terrorist operation in 2007 is another that faces demands for compensation following the Independent Police Conduct Authority's findings last month. But the underlying historical issue - Tuhoe self-determination in its remote territory - has been settled. Its claim to ownership of Te Urewera National Park - bluntly rejected by the Prime Minister three years ago - has produced an agreement that neither the tribe nor the Crown "owns" the park. The park will be a new legal entity in legislation that will give Tuhoe an increasing role in its management as time goes on. To meet the tribe's aspirations to self-determination, it will be given more control of local social services. The settlement is a credit to Tuhoe leaders, in particular their chief negotiator, Tamati Kruger. He managed to keep the talks from being derailed by the 2007 raids and John Key's 2010 comment on ownership of the park. "I think we all sensed within te Urewera that this was going to be the right time," Mr Kruger said at the signing. He gave credit to the Crown negotiators too. Treaty Negotiations Minister Chris Finlayson has acknowledged in plain language the tribe's treatment by colonial forces. Not only was land confiscated, he said, "villages and crops were burned, families killed and men executed". It ought to be noted that the Office of Treaty Settlements does not always contest claimants' versions of history. Settlements are considered more important than rigorous historical inquiry. But the Tuhoe have ample support for their version from the Waitangi Tribunal and academic research. They stand to receive $170 million in compensation. The agreement has yet to be ratified by the tribe but last week's turn-out at Parliament gives confidence that it will be. Mr Kruger hopes some of the $170 million will be used for water supply, sewerage and electricity to remote communities. The Tuhoe deal is one of 12 done with iwi in the current financial year. The Government's aim to have all outstanding Waitangi claims wrapped up in two more years is now in sight. Since 1990, 62 settlements have been reached and while 60 remain, the Crown is talking to claimants in every area. Often the first stage, getting agreement between claimants on their representation, is the most difficult. At times, National has seemed in too much of a hurry to finish the settlements and put history behind us at last. Nothing will be gained if today's deals do not satisfy more than the present generation of claimants. The settlements can never match the monetary value today of the resources iwi lost. They will be "full and final" settlements only once they have managed to lift overall Maori levels of education, employment, business and wealth. If these things happen as a result of the pride and investment of iwi in their own people, history will celebrate events such as Parliament witnessed last week. For the moment, the celebrations of Maori are expressions of hope for the future. Hope is an achievement the whole country could applaud. Moturua Island in Bay of Islands, Northland, NZ. Maori lost swathes of land in the Bay of Islands, including islands now used as millionaires' hideaways, as recently as the 1970s, the Waitangi Tribunal has been told. Claimants, Crown representatives and tribunal members spent Monday touring the eastern Bay of Islands to see first-hand the places being discussed in the current Northland Inquiry hearings at Waitangi. This week it is Ngati Kuta, Patukeha, Te Kapotai and Ngati Manu's turn to air their grievances. Matutaera Clendon (Ngati Kuta) told the tribunal his old family land on Moturua Island was lost to the then Bay of Islands County Council and government agencies in a 1968 rating sale when the owners could not keep up with rates demands. Most of the island is now owned by millionaires. "It's now a rich man's paradise. Both Patukeha and Ngati Kuta feel very aggrieved over the loss of Moturua," he said. Arapeta Hamilton (Ngati Manu) recounted the events of May 13, 1845 - 168 years earlier to the day - when British troops seeking retribution for the sacking of Kororareka (Russell) attacked Te Kapotai's settlement at Waikare, burning it to the ground, killing its livestock and driving its inhabitants into the winter bush. A month earlier British forces arrested chief Pomare and razed his pa, Otuihu, opposite modern-day Opua, even though Pomare was flying a truce flag and played no part in the Battle of Kororareka. Mr Hamilton's contemporary concerns include sewage discharged directly into the bay by thousands of boats. A pumping station at Opua for emptying wastewater tanks was used by the big commercial operators but rarely by smaller vessels. Richard "Blandy" Witehira (Patukeha) said land for the lighthouse at Cape Brett was taken under the Public Works Act but never returned, as required by law when no longer needed for the original purpose. Bai & Khai Duo dodgy plans for Fijian Land! Given the critical importance of land to native Fijians, I thought I will include these pieces posted by Navosavakadua on the FijiToday Blog. It should be thought-provoking to all Fijians in the current political climate as the Bainimarama Dictatorship forces its draft constitution on the people of Fiji. How stupid does Aiyaz Sayed-Khaiyum think we all are? He’s claiming that the ‘conversion’ of 68.7 hectares of native land to Crown grant land under the Qarase Government proves that there never was any protection for Native land entrenched in past constitutions. He knows that there’s always been a provision for the swapping of Native land for Crown land so that essential infrastructure could be provided. His STATE LANDS (AMENDMENT) DECREE 2013 (DECREE NO. 7 OF 2013) deals with this issue, putting an end to this small degree of flexibility in Native land legislation. He claimed this was to protect Native land, but it was never more than an attempt to spread the lie that he was all for protecting Native land. As things stand, Bainimarama’s 2010 Land Use Decree gives him the right as PM to approve 99 years leases under whatever terms and conditions he likes on any native land. He can’t take ownership without proper compensation, but giving 99 year leases with low rents is no different from seizing the land. It will take 4 generations for land to be recovered by its owners. Under all previous constitutions, the Bainimarama Land Use Decree 2010 would be unconstitutional but the Land Use Decree says “This Decree has effect notwithstanding any provision of the Native Land Trust Act [Cap. 134], Agricultural Landlord and Tenant Act [Cap. 270], Agricultural Landlord and Tenant Ordinance 1966 and any other law”. It over-rides every other law of the land. As with all ASK decrees there is specific provision that “any decision of any Minister or any State official or body, made under this Decree” cannot be challenged in a “court, tribunal, commission” etc etc. If Sayed-Khaiyum thinks all this bunkum about land swaps means that we’ll think no protections have been removed he must take us for fools. This smart-alecky school boy debating shows how out of touch he is with reality. Understanding of the implications of the Bainimarama constitution’s abolition of all protection for Native land is slowly spreading. 1. Was the law broken to effect a swap of native land for freehold? 2. Did the landowners get a fair deal? On the first issue, it’s clear the law was NOT broken. For starters, if the law had been broken, Sayed-Khaiyum would have jumped at the opportunity to take the Qarase Government before his hand-picked court. Perhaps, the fact that Qarase relied on legal advice might have complicated matters, but make no mistake the opportunity to expose even an innocent mistake would not have been missed. Without being privy to the details, it seems to me the process was to make an indirect swap. Freehold land was acquired by the State and, under Section 4 of the Crown Lands Act, it is Crown land, and hence capable of being swapped under Section 3. The proof of this comes from none other than Sayed-Khaiyum when he closed what he saw as a loop-hole with (DECREE NO. 7 OF 2013), the STATE LANDS (AMENDMENT) DECREE 2013. If the indirect swap process was not permitted, why did Sayed-Khaiyum need to issue a decree to ban it? But let’s not lose sight of what’s important here. Sayed-Khaiyum thought he could take advantage of the confusion and pose as a protector of Native land. And why did he want to do this? Because he knows that once everybody understands that he’s removed all past Constitutional protections of Fijian land he will be the focus of a lot of anger. As to whether the landowners at Momi got a fair deal, I don’t know and it’s clear there’s a lot of guessing and gossip going on here. The Land Use Decree also requires that “all land available are leased with the purpose of providing a livelihood for all parties concerned”. What does that mean? Tenant’s rights? Take this in conjunction with “socio-economic” rights in the constitution and it looks like the ASK plan is to create rights for landless people to claim unused Native land, or to have existing leases extended. And remember, the PM’s decisions under the decree cannot be challenged in court. All power to Bainimarama. This is typical ASK – sneaky and too clever by half. It’s why the constitution had to be rushed through. It’s also why we haven’t heard any details about decisions made by Bainimarama under the Land Use Decree. But ASK is making a mistake if he assumes we are all too stupid to notice the sweeping powers of the Land Use Decree and the removal of all protection of Native land under the draft constitution. Does Bainimarama have any understanding of what ASK has in mind? Who knows? We can be sure Bainimarama hasn’t read any of the legislation or the draft constitution, but ASK may have told Bainimarama it’s worth trying get these powers over Native land in his hands, as that will be his means of building power. But this is a very high risk strategy. Once the grab for total power over land is understood by landowners and their family members in the military Bainimarama will be in trouble. 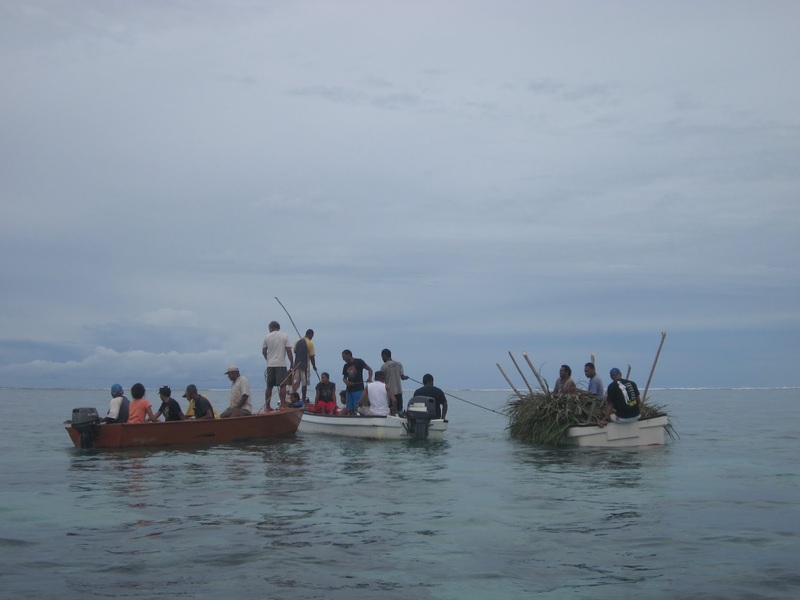 This Fijian article was put together by some very concerned Itaukei on the actions and programmes of the current military regime in Fiji as it relates to their place as indigenous peoples, their institutions in government, protection of their land and other natural resources, and culture since the military coup of December 2006. Ni da raica lesu na veika e sa vakayacora na Matanitu Tu Vakawawa nei Bainimarama mai na Tiseba, 2006 ka yacova mai na gauna oqo, sa matata vakasigalevu vei keda ni sa vakamalumalumutaki na veika eda vakamareqeta na itaukei. Sa volai ena tiki ni pepa oqo na veika e sa vakayacori tiko mai me yacova mai na gauna oqo. 1.0 Ni da wilika ka vakasamataka na Yavu ni Vakavulewa vakaturi eratou sa kacivaka ka tabaka na Matanitu Tu Vakawawa, sa matata vakasigalevu ni sa sega tale ni dua na ka sa qai vo ena kena taqomaki na veika eda dau vakamareqeta okati kina na noda yaubula kei na noda vei Matabose. 1.1.1 Sa kau laivi mai na Yavu ni Vakavulewa vakaturi ni Matanitu Tu Vakawawa, na “nodra taqomaki” (entrenched legislations). Oqo e dua na tiki ni lawa ka rui bibi sara vei vei keda ka vakadeitaki tu mai ena Yavu ni Vakavulewa ni 1970 ni Soli na Tu Galala vei Viti, ena 1990 ka vaka kina ena 1997. Sa kena ibalebale ni sana rawa vua na Palimedi vou me veisautaka na Lawa Taqomaki me sotava na inaki cava ga e gadreva na Matanitu veiliutaki ena noda vanua ni sa kau tani na “tataqomaki” ka kunei ena vei Yavu Vakavulewa e liu, ko ya, ni sega ni rawa ni vakadonui na “veisautaki” ni Lawa taqomaki, ka vakavo duadua ga kevaka era vakadonuya e lewe levu (3/4) na lewe ni Seneti ka digitaki main a Bose Levu Vakaturaga. 1.2.2. Sa yali tale ga na lawa ka kovuta na maroroi ni noda itovo kei na ivakarau vakavanua (customary laws) ka kunei ena Yavu ni Vakavulewa ni 1997 ka vaka kina na vakatutu nei Professor Yash Ghai. 1.3.1 E sega tale ga ni volai e dua na tiki ni lawa me taqomaki kina na noda dodonu na itaukei ni qele me dau soli vei keda e dua na ivotavota dodonu (equitable share) ni “royalty” se na ilavo ni vakavinavinaka ena vakasaqarai ni yau talei (mineral exploitation). 1.4.1 E sega tale ga ni dua na lawa e kovuta na veika e baleta na nodra maroroi ka vaqaqacotaki ni tavi na marama me vaka e volai ena Yavu ni Vakavulewa ni 1997 ka vakatura tale ga o Professor Yash Ghai ena 2012 (vakavo ga ni vakatabui na veivakaduiduitaki ni tagane kei na yalewa). 1.5.1 Na Yavu ni Vakavulewa vakaturi e solianakaukauwa levu ki na tolu na Vale ni Volavola ko ya na Paraiminisita, na Vu ni Lawa (Attorney General) kei na Vosa Vakadua (Chief Justice). .6.1 Sa kau laivi mai vua na Peresitedi na itutu ni Commander in Chief ni noda Mataivalu ka sana soli vua na Paraiminisita. Ni sa liuliu levu ni Mataivalu na Paraiminisita sa kena ibalebale ni na vakarorogo vua na Commander ni Mataivalu, ia, e vakaturi tale ga me digitaka taudua ga na Commander ni Mataivalu na Paraiminisita. Oqo e dua na tikina vakarerevaki ni sana vakarorogo sara ga na Mataivalu kivua na Paraiminisita. Ena veiyasai vuravura tale eso, na Mataivalu e tiki ga ni gacagaca ni veitaqomaki ni Matanitu ka me maroroya ka taqomaki na vanua raraba (state). Ni sa vakarorogo vua na Paraiminisita na Mataivalu sa kena I rairai vei keda ni sana sema vakavoleka na Mataivalu ki na veiqaravi ni Matanitu ka sega ni vakabibitaka na nona I tavi kin a Vanua raraba (state). 1.7.1.Na Yavu ni Vakavulewa vakaturi e vakadeitaka na nodra vakabulai tiko ga na veidikiri (ka vakavo ga e lima ka volai ena s 160), eratou sa kacivaka oti ka sa taurivaki tiko vei keda na leweni vanua e Viti ena gauna oqo. Eso na dikiri oqo, eda vakuwai kina na lewenivanua ena noda rawa ni taura na gaunisala vakalawa meda vakataroga ka vaqaqa na dina ka vaka kina na noda vakadeitaka na noda dodonu. 1.8.1 Na Yavu ni Vakavulewa oqo e vakadeitaka na veivakagalalataki (immunity) ena veicala ni vuaviri sa vakayacori oti. Na tikina oqo ena vakabulabulataka tiko ga na vakayacori ni Vuaviri e Viti ni vakabulai tiko ga na vakasama ni ‘veivakagalalataki’. Eda sa kila kece na dredre levu e kauta mai vei keda na vuaviri kece e vakayacori ena noda vanua. 1.9.1 Oqo na ulu ni noda matabose na kawa itaukei, ka ra dau vakasamataka na vakatutu ni Matanitu ka tara se yavalata na veika eda vakamareqeta na itaukei. NI sa bokoci vakadua, sa kena ibalebale ni sega tale ni qai rogoci na domoda se na noda rai me vaka ni da itaukei dina ni vanua oqo, ka taukena na qele keina iqoliqoli ena veika e via vakayacora na Matanitu. Sa ka bibi me vakabulai tiko na Matabose bibi oqo, ni oqo ga na vanua eda kilai kina na kawatamata itaukei ni da I taukei ni vanua oqo ka dodonu me rogoci tiko na domoda ena liutaki ni vanua oqo ka vakauasivi ena veilawa vakaturi se yavu ni cakacaka ka na tara yani na veika eda vakatoka ni noda ka okati kina na noda qele kei na I qoliqoli ka vaka tale ga kina na kunei ni yautalei ena noda qele se ena noda iqoliqoli kei na uciwai. ii) Ni sa rawati na veika e volai ena i) e cake, sana qai vakayacori tale e dua na ‘referendum’ (meda tukuna na lewenivanua na noda nanuma) ka me 75% ni dauveidigidigi (voters) mena vakadonui na veisau vakaturi. 2.1 Ni sa vaka tu oqo na veika e sa volai ena Yavu ni Vakavulewa vakaturi ni Matantu Tu Vakawawa, sa dodonu meda vakasamataka sara vakatitobu na revurevu ni Lawa Tu ni noda Vanua vei keda na taba tamata oqo ka vakauasivi vei ira na luveda kei ira na luvedra ena veigauna mai muri. i) Mai vakarubeci na Bose Levu Vakaturaga (BLV) mai na Evereli 2007 ka mai bokoci vakadua na BLV ena 2012. Oqo na matabose bibi duadua vei keda na itaukei baleta ni ulu ni veimatabose kece ni taukei. Oqo na matabose ka soli Viti ki Peritania, na Matabose ka maroroi Viti tu mai, maroroi keda tu mai na kawa itaukei kei ira na dui kaikai ka da sa mai bula vata tu nikua ena loma ni dua na drau vasagavulu vakacaca na yabaki sa oti (140+ years). ii) Kau tani vakadua vei keda na itaukei na itikotiko ni BLV mai Draiba kei na kena iyau, Suva. Oqo e dua na tatadra ni BLV ena 70+ na yabaki sa oti, me bau dua na ka eda bau kilai tani kina na itaukei ni vanua oqo. iii) Sa vakuwai na BLV ena I tavi me digitaka na Peresitedi ni noda vanua kei na nona ivukevuke. iv) Sa vakuwai na BLV ena nodra dau dikeva na veilawa vakaturi kece ka tara yani na veika e baleti keda na itaukei ka oka kina na noda iyaubula. Sa sega ni qai vakayacori tale na veivosaki kei na rogoci ni rai kei na vakatulewa ni BLV ena veika bibi me vaka oqo. v) Sa mai kautani na ulu ni Ranadi ena noda ilavo ni Viti ka sega ni qai rogoci kina na nodra rai kei na vakatulewa na lewe ni BLV. E se sega ni vakasukai mai vakavanua na veibuli vakavanua era a vakayacora na turaga bale kei Viti ki na kawa vaka-tui mai Peritania me sa taura na itutu vaka Tui Viti. Na I otioti ni veibuli oqo e a vakayacori ena 1937.
vi) Sa kacivaka tale ga na Matanitu me sa veisautaka na kuila ni noda vanua, ka sega tale ga ni rogoci taumada na nodra nanuma na turaga kei na marama bale ni noda vanua me vaka na kena ivakarau. vii) Sa kau tani mai vakatawadodonu mai na BLV na lewai ni nona iuma ilavo levu ka vakatokai na Fijians Trust Fund. viii) E rogo vakawasoma na vosa ni veibeci, na vosa ni veivakalolomataki kei na vosa ni veivakasesewani vei ira na noda turaga bale kei na noda marama bale ka vaka kina vei ira na noda iliuliu vakavanua. ix) Sa vakamatanitutaki na yaca na “Fijian” me sa yacada raraba e Viti (se o kai Idia, Javani, Rusia se kai vei ga). Sa sega mada ga ni bau rogoci kina na domodra na BLV se domoda raraba na itaukei ni vanua ko Viti. i) Tekivu na veiliutaki ni Matanitu nei Bainimarama sa tekivuvata mai na nona vakalolomataka, vakasesewana kei na nona vosavakacacataka na Lotu Wesele. Sa guilecava sara ga na Matanitu na cakacakalevu ni veivakararamataki, veimaroroi, veisusugi, veituberi, veivakasulutaki kei na veikauwaitaki sa cakava na Lotu Wesele vei Viti kei ira na kena kawa tamata. E vuqa vei ira na qase ni lotu mai vanua tani kei ira na itaukei era solia na nodra bula ka ra bale mate koto me bula ko Viti kei na kiena kawa tamata. ii) Vakatabuya na Lotu Wesele mai na nona dau qarava na Bose Ko Viti mai na 2009 ki na 2011 ka vaka kina na kena mai vakadrakidrakitaki na Bose ko Viti ena 2012.
iii) Vakatabui na soqo kei na kumuni lavo ni lotu. v) Era bau curuma tale ga na Vale ni Veilewai ena nodra via maroroya na Lotu Wesele. vi) Era sa curuma na veibose ni Lotu na Tabana ni Ovisa kei na Mataivalu me rawa ni yalani kina na veika era bosea. 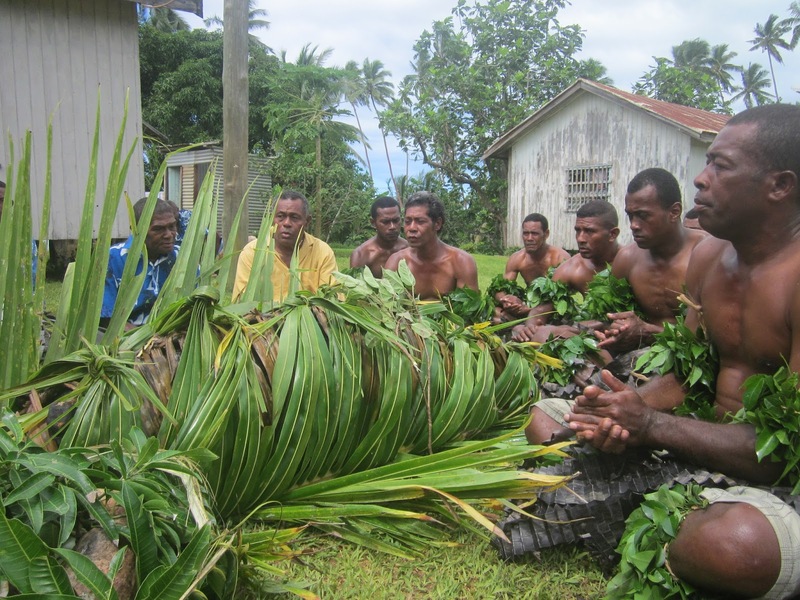 i) Sa veisautaki na yaca na Native Land Trust Board ki na – iTaukei Land Trust Board. ii) Sa bokoci na nodra ivotavota ni lavo ni lisi na Turaga I Taukei, Turaga ni Qali, Turaga ni Yavusa kei na Turaga ni Mataqali. Ena gauna oqo, sa tautauvata ga na nodra ivotavota na Turaga I Taukei kei na dua na gone e se qai sucu, veitalia ga se tiko mai Viti se mai vanuatani. iii) Sa sega tale ni qai rogoci na nodra rai kei na nodra vakasama momona ka titobu na noda lewe ni BLV me baleta na cicivaki kei na vakatulewa ni Matabose ni Qele Maroroi. Sa digitaka ga o Bainimarama na lewe ni Matabose ni Qele Maroroi ka ra dau digitaki e liu mai na BLV. iv) Sa tauyavutaka na Matanitu e dua tale na tabana ni Qele ka vakatokai na Land Bank k asana rawa ni vakamalumalumutaka sara na itavi ni Matabose ni Qele Maroroi. v) Veisautaki e levu na gacagaca ni veiqaravi ni Matabose ka sa vakatulewa ga kina na Matabose ka digitaka ko Bainimarama. vi) Bokoci laivi na musuki ni soli ni yasana mai na ilavo ni lisi me vaka e dau vakayacori tu mai liu, e.g. Ba Provincee, ka sa vakavuna na medre kei na dredre levu sara ena cicivaki ni Yasana levu oqo. vii) Tubu cake vakalevu na cakacaka vaka-butobuto ena loma ni Matabose me vaka eda sarava tiko ena TV ka da wilika tale tiko ga ena niusiveva. i) Sa imatai ni Yasana me vakatabuya na Matanitu na dabe kei na nona qarava na nona itavi na Bose ni Tikina kei na Bose ni Yasana ‘o Rewa. E sega ni dua na ka me tarova na nona vakayacora na vakatatabu oqo vei ira tale na vo ni Yasana. ii) Sa mai kacivaka raraba ena walesi ko Kanala Apakuki Kurusiga ena Siga Tabu na I ka 24 ni Maji 2013 ni sa matabose vaka-matanitu na vei matabose kece vakoro, Bose ni Tikina kei na Bose ni Yasana. Sa kena ibalebale oya vei keda ni sana lewa ga na Matanitu na veiulutaga me bosei kei na ka me qarava na vei Matabose oqo. iii) Ena gauna tale ga oqo,sa digitaka ga mai na Matanitu o cei e vinakata me iLiuliu ni Bose ni Yasana, se lewe ni bose digitaki se sega.Sa vakaraitaka tale ga o Kurusiga ena walesi ni sana digitaka ga na Matanitu e dua e rawarawa ni rau cakacaka vata. iv) Sa sega ni veirauti na ilavo e solia mai na Matanitu me cicivaki kina na Bose ni Yasana ka sa sega sara tale ga ni da vakila na kedra yaga na vakailesilei me vaka eda da kila e liu. v) Sa levu na ituvatuva ni Matanitu sa sega ni qai rogoci kina na Roko Tui kei na Vale ni Volavola ni Yasana. vi) Sa rairai guilecava tiko beka na Matanitu ni dua na ilavo e cicivaki tiko kina na Vale ni Volavola ni Yasana eda solia na lewe ni Yasana. i) Sa veisautaki na yaca ni Matabose mai na Fijian Affairs Board kina iTaukei Affairs Board. ii) Nikua, sa matabose ga nei Bainimarama na matabose oqo baleta ni sa digitaki ira kecega na lewena ko koya. E liu era dau lewe 9 na lewe ni Matabose era dau digitaki mai na BLV. iv) Sega ni vakilai na yaga ni Matabose ni sa lailai na ilavo ni veiqaravi..e.g. Na Vuli ni Veiliutaki eratou sa laki lili toka vei iratou na Tabana mai USP ka veituberi ena Bibi ni Maroroi kei na Vakayagataki Vakayalomatua ni noda Yaubula kei na Veikabula. vi) Sega ni dua na itukutuku matata ni Lavo ni Bisinisi se na Small Business Loan vakauasivi na “ilavo soqoni mai na saumi ni dinau” ka sa dodonu me sauma lesu kina Matanitu levu. vii) Na itavi levu ni Matabose ni Veika Vakaitaukei me cakacakataka na lewa ni BLV, ia ni sa mai bokoci na BLV, sa sega ni da kila na cava eratou bosea me maroroi kina na veika e baleti keda na kawa itaukei. Eda sa kila ga ni sa talaraki yarayara ga na veika e baleti keda na itaukei ni vanua oqo. i) Sa digitaka ga o Bainimarama o ira na lewe ni Matabose bibi oqo. 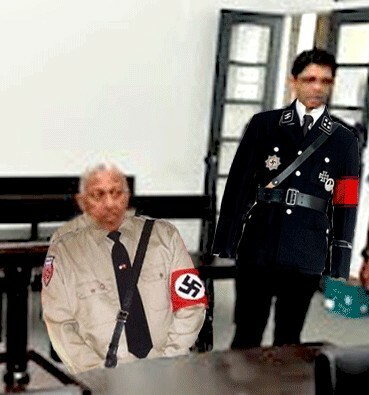 E dau vakaitavi na BLV ena nodra digitaki na lewelevu era lewe ni Matabose bibi oqo, ia, sa qarava ga o Bainimarama na itavi bibi oqo. ii) Era sa sega ni vakatulewataka na noda Turaga kei na Marama na lewe ni BLV na Budget ni Matabose oqo, na Tuvatuva-ka (Strategic Plan) kei na Tukutuku Vakayabaki. iv) Vakamalumalumutaki ni taukeni ni yau – sa vuki na sea e 10na milioni ena FHL ka solia vakailoloma na Matanitu ena vuku ni veivakadonui ni BLV, me sea ka dinautaki mai na Matanitu. Sa kena ibalebale ni sana sauma taumada na Matabose ni Tobu ni Lavo Maroroi ni Taukei na isau ni sea oqo kina Matanitu. Ia, e a tauyavutaki na Matabose ni lavo oqo me vakatubuilavo me rawa ni cakacakataka kina na veika e baleti keda na kawa itaukei ka okati kina na qaravi ni BLV. i) Vakamalumalumutaki na Kabani cokovata ni Taukei me sa laki vakarurugi tale kina Fijian Holdings – ia, e a tauyavutaki taumada na YHL me vukea na FHL ena vakarabailevutaki ni taukeni bisinisi kei na noda rawa-i-lavo mai na buturara ni bisinisi. ii) Sega ni matata vakavinaka vei keda na “tubu” e rawa mai na veivoli oqo kei na “veisau” ni tubu (dividend) eda na namaka ena veivoli oqo. i) Vakamalumalumutaki na bisinisi ni taukei ka cicivaka na FHL me vaka na bisinisi ni buli simede, ni sa tauyavutaka tale na Matanitu e dua tale na bisinisi ni buli simede ka rau wasea vata kei na Standard Industries na bisinisi ni simede e Viti kei na wasa Pasifika. ii) Sega ni dokai na vakatulewa ni BLV me tokona na YHL na taukeni ni yau vakabisinisi ni Taukei me vaka sa tekivutaka main a FHL. Sa volia tale naFHL na Kabani ga ka tauyavutaki me vukea na FHL ena noda taukeni bisinisi kei na taukeni yau ni kawa tamata itaukei. i) Sa sega ni vakayacori na veirogoci ena veisau kece ni Lawa e kovuta na noda yabula. Sa ka bibi me rogoci na domoda na I taukei ni yaubula mai vei ira na noda Turaga kei na Marama Bale ena veika eda dau vakamareqeta na itaukei. ii) Na “kaukauwa levu” e sa tu vua na Vunilawa ni Matanitu ena ruku ni Surfing Decree. i) Vakamalumalumutaki na noda dodonu meda vakatulewataka ga na veika e baleta na noda liutaki me vaka e volai vakamatata ena Lawa ni Matabose kei Vuravura, na United Nations kei na veidusidusi tale eso mai na veimatabose levu kei Vuravura. i.e. na Bokoci ni BLV, na nona digitaka ga na Matanitu na iLiuliu ni Bose ni Yasana, etc. i) Sega ni qai Rogoci na domoda na iTaukei (through the BLV) ena vakatulewataki ni Yavu ni Vakavulewa ni noda Vanua. ii) Sa sega ni qai dua na ka e koto ena Yavu ni Vakavulewa vakaturi ni Matanitu me qai maroroi keda na itaukei baleta na noda itovo, ivakarau, noda qele, noda iqoliqoli, noda iyaubula kei na veika eda dau vakamareqeta. iii) Ni sa vakadonui na Lawa Vakaturi oqo, e sana bau wadrega me veisautaki e dua na tikina ni sa vakadredretaki ena ruku ni lawa vakaturi oqo. i) Eda sa tautauvata ga nikua na itaukei kei ira na kai idia, na kai Jaina kei na vei kawa tamata tale eso ena noda vanua dina me vaka ni sa sega tale ni dua na tiki ni Yav ni Vakavulewa vakaturi, me maroroi kina na veika e baleti keda na itaukei ni vanua oqo. ii) Sa bokoci vakadua na domoda na kawa itaukei – oya na BLV. iii) Sa qai levu ga na ivakarau kei na vosa vakaviavialevu eda sa raica, rogoca ka sotava ka sarava tu nikua. iv) Sa qai levu ga na kucu kei na cakacaka vakabutobuto ena noda Vanua. v) Sa da ririko ka domobula ena levu ni dinau sa cakava tu oqo na Matanitu ko Viti. Sa sega ni qai veiraurau na veika eda rawata kei na veika eda sa vakayagataka. Na taro levu meda taroga na lewe iViti, “Se o cei ena qai sauma na dinau levu oqo?” Sega li ni ko ira na luveda kei ira na makubuda? vi) Sa bokoci na ‘quota system’ ena veika vakavuli me vaka na iwiliwili e dau vakadeitaki vei keda na kawa itaukei ena vuli Vuniwai etc. viii) Sa dolavi ga vakaveitalia na noda veiwekani (diplomatic relations) kei na veimatanitu rerevaki eso me vaka na Non Aligned countries. ix) Kevaka eda sereka na veika lelevu, ka rerevaki sa tarai Viti tu nikua, e sana ka ni veitalanoa ena siga kei na bogi, e-ticketing, one child one computer, etc. 3.1 Me da nanuma tudei tiko ni sa itavi ni Matanitu cava ga e veiliutaki me vakatorocaketaki keda taucoko na lewenivanua ka dodonu me cakacaka ena yavu e dina, dodon ka savasava. Meda kakua ni volitaka na noda itutu vaka taukei ni vanua oqo kei na noda dina ki na cakacaka ni veivakatorocaketaki sa cakacakataka vei keda na Matanitu Tu Vakawawa oqo. Sa nona I TAVI ga, meda rai ga ki liu ka taqomaka na veika e noda, ka da kilai tani kina na kawa tamata itaukei.